Impress and express with this chocolate extravaganza from New York's favorite chocolatier, Jacques Torres! Packaged in Jacques' signature hat box, this gift basket is the ultimate present to bring anyone over to the sweet side of life. Gift includes: 50-Piece Bon Bon Assortment, 10-Piece Champagne Truffles, Dark Chocolate Orange A-Peels, Chocolate Covered Malt Balls, Milk Chocolate Covered Cheerios (CHEERIOS is a registered Trademark of General Mills), Dark Chocolate Corn Flakes, Milk Chocolate Raisins, Dark Chocolate Graham Crackers, Small Dark Chocolate Almonds, and a variety of 4 Chocolate Bars*. *We reserve the right to substitute any item of equal value. Container shape and color may vary. Allergens: Prepared/packaged using machines that process dairy, soy, wheat/gluten, fish, eggs, nuts, tree nuts and peanuts. Contains nuts, peanuts, milk, soy. A variety of 4 Chocolate Bars. 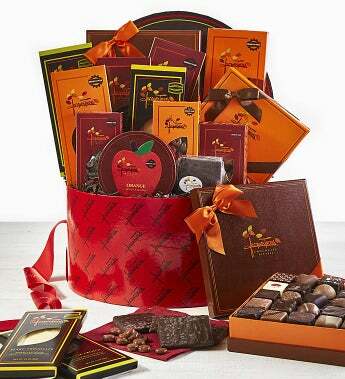 Impress and express with this chocolate extravaganza from New York's favorite chocolatier, Jacques Torres! Packaged in Jacques' signature hat box, this gift basket is the ultimate present to bring anyone over to the sweet side of life. Gift includes: 50-Piece Bon Bon Assortment, 10-Piece Champagne Truffles, Dark Chocolate Orange A-Peels, Chocolate Covered Malt Balls, Milk Chocolate Covered Cheerios (CHEERIOS is a registered Trademark of General Mills), Dark Chocolate Corn Flakes, Small Dark Chocolate Almonds, a variety of 4 Chocolate Bars and much more. All presented in a beautiful signature hat box.